There are different drugs applied to different kinds of bacterial infections. The targeting of different aspects of bacterial diseases is especially useful in the face of antibiotic resistance. These drugs are generally called antibiotics, although the mechanisms of action differ according to how it controls bacterial infection. Antibiotics are grouped as either bactericidal or bacteriostatic. The mechanism of action (or mode of attack) of the bactericidal drugs affect the cell wall, lipids, enzymes such as gyrase, protein synthesis or a combination of these mechanisms. The action of bactericidal drugs is most effective when applied to control actively dividing cells. This mode of action results in bacterial cell death. The more general term bactericide refers to any substance that kills bacteria, which includes antibiotics, disinfectants or antiseptics. These are antibiotic drugs that inhibit the growth of bacterial cells. This is achieved by obstructing metabolic mechanisms of the bacteria, in most cases protein synthesis. This inhibits any further growth of the bacterial cells, although it does not cause cell death. There are some exceptions where large concentrations of bacteriostatic agents may kill susceptible bacteria. These are both antibiotics, with bactericidal drugs classified as bacteria-killing, and bacteriostatic drugs as bacteria-inhibiting. There is a minimum bactericidal concentration (MBC) necessary to kill bacteria, while bacteriostatic antibiotics need to comply with a minimum inhibitory concentration (MIC) in order to function effectively. Generally, bactericidal antibiotics cause cell death by preventing cell wall synthesis of the bacterial cell. This reduces the number of bacterial cells present. Bacteriostatic antibiotics are applied to bacterial infection since it prevents further cell growth. This is achieved by inhibiting protein synthesis, DNA replication or other cellular metabolic actions, although it does not cause bacterial cell death. This effect is reversible, unlike the action of bactericidal drugs. 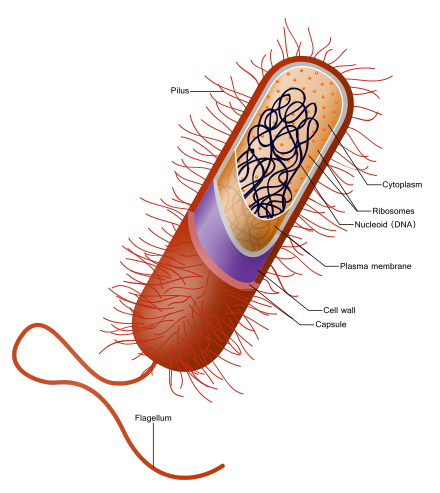 The amount of bacterial cells, therefore, remains the same, although in a static phase. The bacteriostatic drugs also differ since it needs to function alongside the host immune system to overcome the bacteria, while the bactericidal agents kill bacteria, but may cause inflammation due to the release of bacterial cell contents and sometimes toxins. The application differs according to the type of bacterial infection, since certain antibiotics may be bactericidal in some cases while acting as a bacteriostatic drug when confronted with a different strain of bacteria. Its use depends on the type of infection, with bactericidal drugs often used for diseases such as endocarditis or meningitis. Bacteriostatic drugs are often applied in cases of urinary tract infections or wound infections, where the danger of toxic shock syndrome is high. Bactericidal drugs with a rapid mode of action will often stimulate severe inflammation due to the release of bacterial cell contents upon cell death, which can result in toxic shock syndrome. This means that in certain cases, bacteriostatic drugs are often preferred to limit the spread of toxins, for example, in the case of gangrene. Bacteriostatic drugs have no side effects other than preventing bacterial growth, although if removed from the system its effect is reversed. The outcome can be affected by various factors, including the bacterial density, host immune response, underlying disease or the site of infection. Bactericidal drugs applied in high concentrations in cases of compromised drug penetration, although these are not necessarily superior to bacteriostatic drugs. 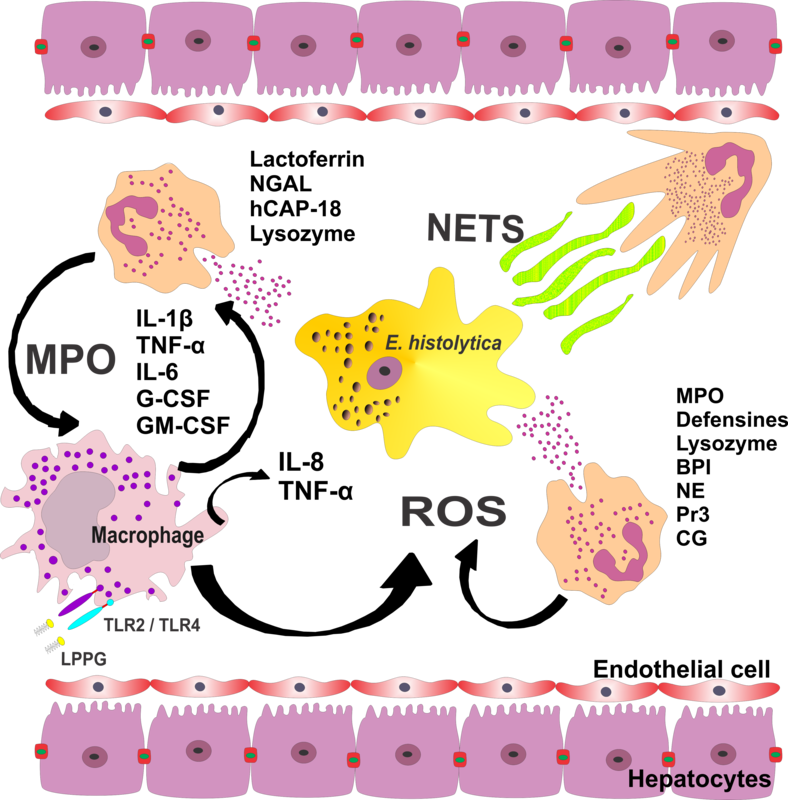 Since the bactericidal cells are most effective against dividing cells, its efficacy may be reduced if treatment is paired with the slower growth caused by bacteriostatic drugs. At low concentrations, the efficacy of bactericidal drugs may be reduced to merely bacteriostatic effects. On the other hand, bacteriostatic drugs can kill bacteria in some cases, especially at high concentrations. Some typical examples of bactericidal drugs include derivatives of penicillin, monobactams, vancomycin, and monoglycosidic antibiotics. The bacteriostatic antibiotics include tetracycline, spectinomycin, macrolides, sulfonamides, among many others. Bacterial infection can be countered by antibiotic or antibacterial agents. These are classified as either bactericidal, which kills the bacteria, or bacteriostatic, which inhibits any further growth of the bacteria. The mechanism of bactericidal drugs destroys the bacterial cell wall, while the bacteriostatic mechanism inhibits protein synthesis. Popular belief has created a preference for bactericidal drugs, although evidence suggests bacteriostatic drugs can be equally effective without any of the bactericidal side effects, such as toxic shock syndrome. The type of infection will determine which class of antibiotic to use, or even a combination of the two. Mardi Stratuss. 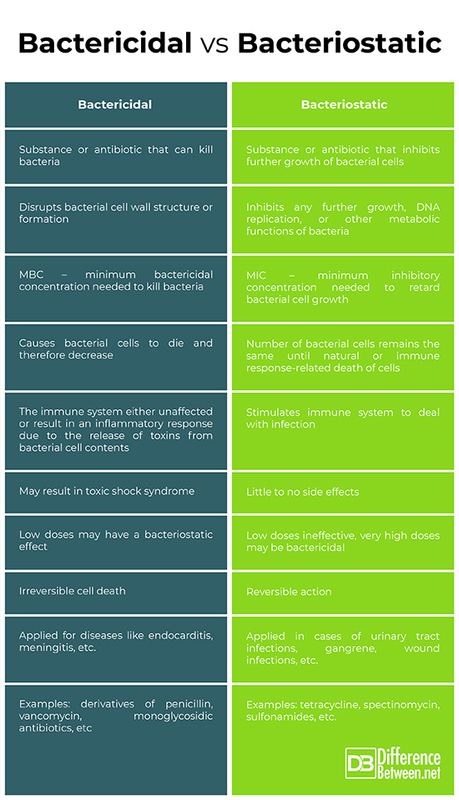 "Difference Between Bactericidal and Bacteriostatic." DifferenceBetween.net. November 22, 2018 < http://www.differencebetween.net/science/difference-between-bactericidal-and-bacteriostatic/ >. Maddison, Jill E., A. David J. Watson, and Johnathan Elliot. “Antibacterial drugs.” Small animal clinical pharmacology 5 (2008):148. Ocampo, Paolo S., et al. “Antagonism is prevalent between bacteriostatic and bactericidal antibiotics.” Antimicrobial agents and chemotherapy (2014): AAC-02466. Pankey, G.A., and L.D. Sabath. “Clinical relevance of bacteriostatic versus bactericidal mechanisms of action in the treatment of Gram-positive bacterial infections.” Clinical infectious diseases 38.6 (2004): 864-870.